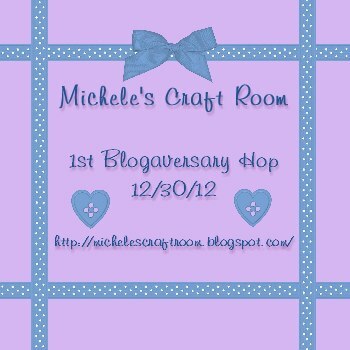 My Life In Arts n' Crafts: Michele's Craft Room Blogaversary hop!! 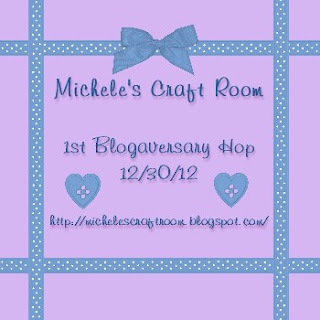 Michele's Craft Room Blogaversary hop!! Happy 1 year of blogging to Michele!! She’s got an amazing giveaway going on right now for the hop too!! Today I made a project with well if you follow me you know I am obsessed with my cameo. This card is for a little battery operated tea light to make a night light kind of thing. The sentiment is one I just came up with to go with the fire, and printed it out on some pattern paper. Make sure to follow along with my blog to because we have some exciting stuff happening in January, over here!!! You wont want to miss it!! Michele has an amazing "present" up for grabs ~ all you have to do is visit each of the blogs below, become a follower and leave a comment. A winner will be chosen on Wednesday 1/2/13! The following ladies have graciously shared their time with us today and have some fabulous projects to share with you so lets get hoppin'!!! Happy New Year ~ Hope it's the best one ever! Congrats to Michele. This flameless fire is awesome. I love to see these as part of a card. I am a new follower. Hope you will stop by when you get a chance. I love the design of this card! The vellum creates an amazing effect, the sentiment is perfect and I love the little heart cut outs. So pretty! Hi there, sweetness!! You know I am a follower (STALKER!) of yours, so I'm looking forward already to what's up your crafty-sleeves for 2013. This card is SO CUTE. Very creative and fun. I may have to put it on my list of things to steal! HAHAHA. May the year ahead bring you many crafty adventures. Happy New Year! Jessi, this is amazing. Love it!!!! Can't wait to see what you bring to us in 2013!!!!!! Already a follower of your awesome blog! Fabulous. What a great idea. i love it... Thanks for sharing. wow, love this idea! thank you, and it's beautiful!! I think that is the cutest thing I've ever seen! You all do such creative work and it inspires my own thoughts! Fun to see how you incorporated the candle! Thank You. Love this Idea and that it can be used as a night light!! I am a new follower and look forward to 2013 here on your blog!! What a great card. I just got a cameo as a early Christmas present to myself. I'm a little ashamed I haven't even taken it out of the box. Soon though, soon. What a fantastic idea. Super creative and love the effect. This is an awwwwwesome card...I love the campfire so much!! Great project!! Love this idea!! This is so darn cute, I need to go get me some of those lights and try this. Cute card! I follow via GFC: allibrary. Thanks for the giveaway! Good going girlie. Love this card as you already know and it sure does show how talented you are. Love what you've done with the blog too. 2013 is your year! Hugs. Wow! !1 I love your "fire". Fantastic idea..Glad to be part of this hop with you! Very cute. Have a wonderful New Year. I am loving the flameless fire!!! This card is awesome!!! Reason #536 to buy a Silhouette!!! very cute card. Love the way you light it up! This is so pretty and unique. Love the papers you chose and the cut is adorable. That is super cool! I just got some light tea lights. I'll have to try that! Very cute card Jessi! I love the use of the little tea light! This one is HOT ! I'm just letting you know, I'm "borrowing" this one ! HNY,following you for quite awhile. I love the light up flame on that card! GREAT idea.